Today we welcomed a third visit from Lebanon Evangelical School in Tyre. 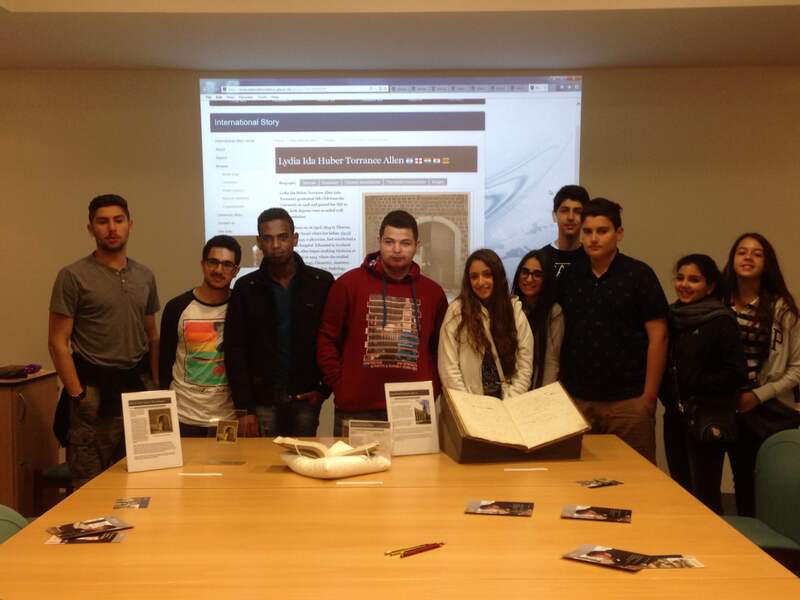 Ten students from Grade 10A came to visit Special Collections at the University of Glasgow Library and discover the links their school, and Lebanon in general, has with the University. Their school was founded in 1860 by the wife of Glasgow graduate, James Bowen Thompson (MD CM 1836). Thompson had entered service with the Syrian Medical Aid Association in 1844. In his post as Chief Medical Officer in Damascus, he met and married Elizabeth Maria Lloyd, who set up the first schools for girls from around the region of Syrian Antioch (Turkey) and in to modern day Lebanon. The students viewed James Bowen Thompson’s signature in the Graduation Album of Higher Degrees in Medicine 1817-1883 (GUAS Ref: R1/5/1). We also explored some further links between Glasgow and Lebanon as seen on the International Story web-pages. One of the earliest Lebanon-born students at the University, for example, was Munib Emir El Ghurayib. He enrolled at the University one hundred years ago, in 1915, for two years to study an Arts course, and went on to teach Arabic at Kingsmead, Birmingham, a training institution of the Friends’ Foreign Mission Association. We also shared the story of Lydia Ida Huber Torrance Allen (née Torrance). She graduated MB ChB from the University in 1918 and MD in 1923 and was a very successful student, winning many prizes and graduating with a Commendation for both degrees. Although born in Tiberias, modern day Israel, where her father, David Watt Torrance, a physician, had established a missionary hospital, Lydia received her early education in Beirut. Perhaps at one of schools established by Elizabeth Bowen-Thompson, who was the first to establish schools for females in the region. 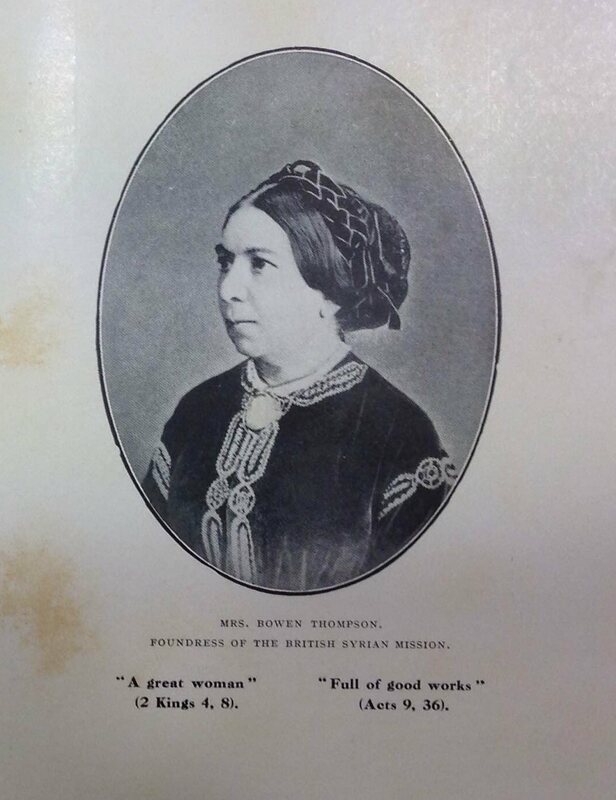 Andrea from the School also brought us along a lovely volume called ‘Sunrise in Syria’ that included information about and a picture of Mrs Bowen Thompson. Thanks to Caitlin Jukes, PhD student of Microbiology currently working on a project within Special Collections, who helped organise and present the records and thanks to Andrea Smith who contacted us from the School and also brought us along the lovely book to see! Find out about previous visits from the Lebanon Evangelical School here.